This bread pudding with vanilla rum sauce is the ultimate comfort dessert. It’s made with baked brioche bread and a rich custard along with golden raisins and chopped pecans. And it gets even better with the warm vanilla rum sauce drizzled over the top. Bread pudding is a combination of day old bread, sugar and egg custard, raisins, and sometimes nuts and chocolate chips. It is baked in the oven and often served with a rum or bourbon sauce. Can I use fresh bread for bread pudding? 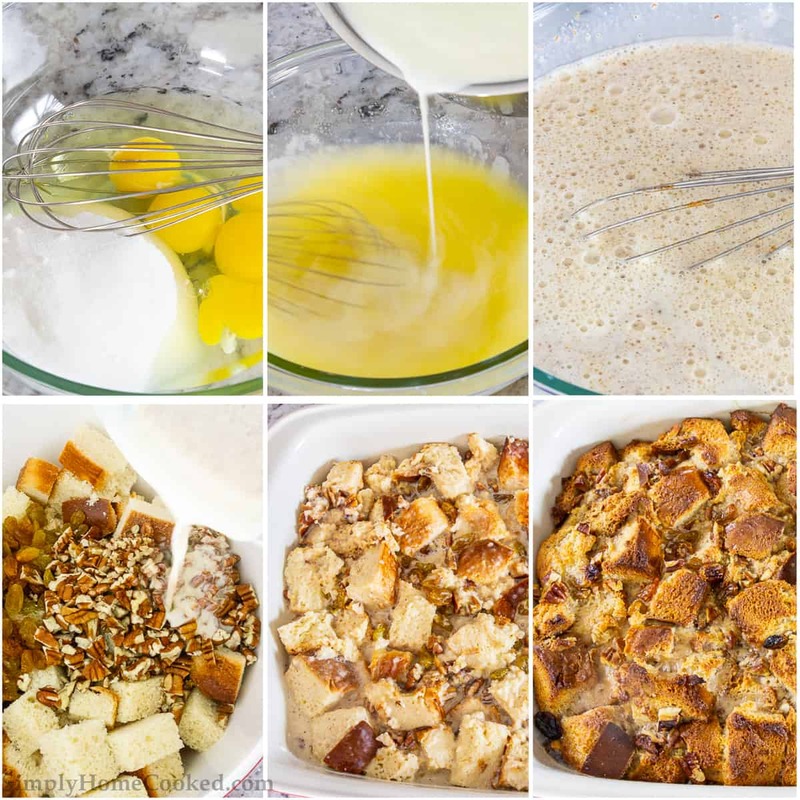 Although bread pudding it typically made with stale bread, you can use fresh bread. Just cut it into cubes and toast the bread in the oven for a few minutes at 350 degrees Fahrenheit into it begins to toast lightly. Bread pudding is often made with french bread. But using toasted brioche bread will give you optimal results. Make the vanilla rum sauce the night before. Cover and refrigerate. Slice and toast the brioche, place it into a large bowl, add pecans and raisins. Cover and leave at room temperature. Measure all ingredients needed for the custard the night before. All that’s needed the day of, is to make the custard, pour it over the bread and bake it. Slice brioche bread into cubes then lay the bread into a baking sheet and toast it in the oven for a few minutes. Whisk eggs and sugar in a bowl and slowly pour hot heavy cream into the bowl while constantly mixing. Then stir in cinnamon and vanilla. Place the toasted bread into a large bowl and pour the egg and heavy cream mixture over it. Then add chopped pecans and raisins. Pour the bread pudding into a 9 x 13-inch baking pan and bake it for 40 minutes at 360 degrees Fahrenheit. Mix sugar and cornstarch together and set aside. 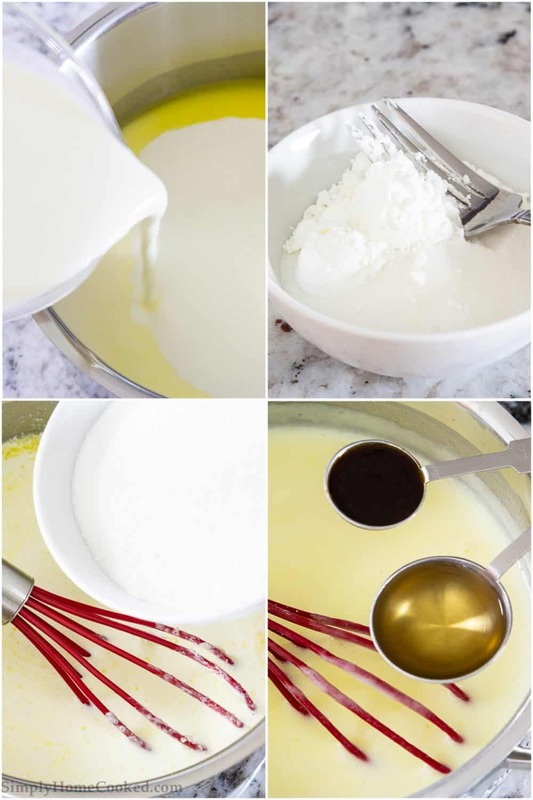 Melt butter and heavy cream in a saucepan, then add the sugar and cornstarch mixture. Let the sauce simmer until it thickens. Turn the heat off and add rum and vanilla extract. Cinnamon Rolls: With pecans and cream cheese frosting. Peach Crisp: Butter, brown sugar, oatmeal, and vanilla. Sweet Poppyseed Pull-Apart Buns: Sweet walnut poppyseed filling tucked into pockets of fluffy yeast dough. 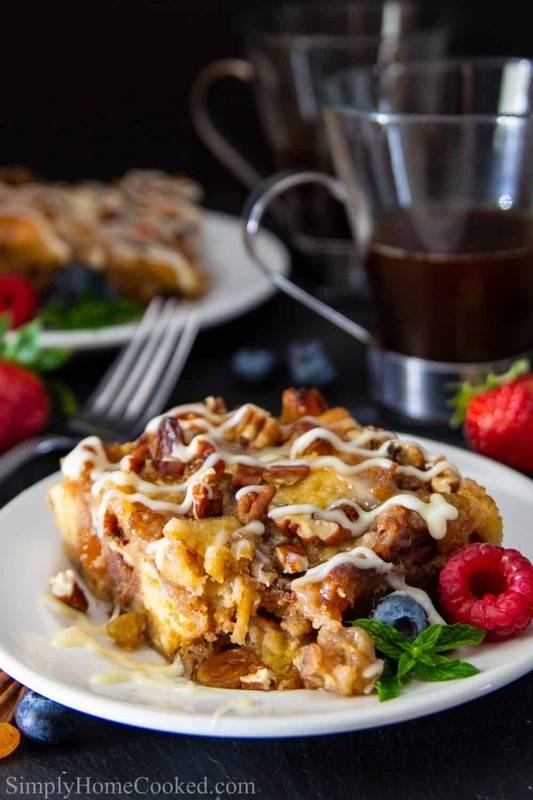 This is simply the best bread pudding you've ever had! Loaded with chopped pecans and golden raisins and topped with a vanilla rum sauce. Cut the brioche bread into cubes and set aside. In a bowl, combine 4 eggs and 3/4 cup sugar. Heat 4 cups of heavy cream in a saucepan just until it comes to a slight simmer (not a boil). The slowly put the hot cream into the egg and sugar mixture making sure to stir constantly. Add the cinnamon and vanilla and stir lightly just to incorporate. In a large bowl add the cubed bread, golden raisins, and chopped pecans. Then pour the warm cream and sugar mixture into the bowl. Gently stir with a spatula. Butter a 9×13 inch baking pan and pour the bread pudding into it. Bake at 360 degrees Fahrenheit for 35-40 minutes. Meanwhile combine the cornstarch and 1/2 cup sugar and set aside. Melt 3 tbsp of butter in a small saucepan, then add 2 cups of heavy cream, and the sugar and cornstarch mixture. Stir or low heat until it begins to thicken. Remove from heat and add the 1 tsp vanilla and 1 tbsp rum. Once the bread pudding is baked, pour the sauce over the top. The best bread pudding for sure, I cannot wait to serve it to my family. Thanks for all the tips – so helpful. I love everything about this bread pudding! Reminds me a little of french toast but in a casserole form. And that vanilla rum sauce looks heavenly. Thank you, Kat! 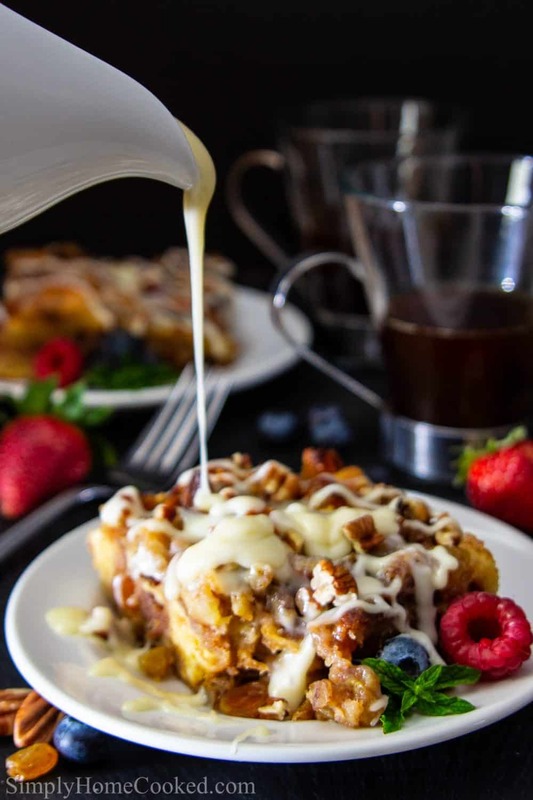 The Rum sauce is definitely the highlight of this bread pudding recipe! Bread pudding with rum sauce is an absolute classic here in the UK. We can actually buy the rum and brandy sauces before Christmas in every supermarket but I am sure your homemade recipe is miles better! You are absolutely right, it’s best made with brioche! Yum! Wow, the bread pudding looks so good! I love the addition fo rum to this recipe, I bet it adds a nice kick to it. thanks for sharing! Thank you Natalya! The rum gives the vanilla sauce such an amazing flavor. The bread pudding would be incomplete without it! I wanted to do as much ahead as I could, so I read your “do ahead” instructions, but I read them hastily and made the custard the night before (tonight) instead of the rum sauce. Will that be a problem in the morning when I pour it over the bread and bake? Can’t wait to make. My question is in the instructions for the bread pudding part it says add 1/2 cup sugar to the eggs but the ingredients list 3/4 cup sugar. What happened to the other 1/4 cup sugar? Hi Reham, thank you for bringing that typo to my attention. It should say “add 3/4 cup sugar to the eggs”. I’ll fix that right now. One of the best desserts I have ever had.